Bottom Mount Pressure Gauges are designed with two-tone dials making them easy to read. Every gauge is tested for accuracy and leakage. 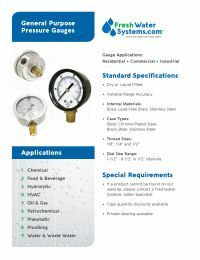 This Pressure Gauges is designed for demanding applications such as reverse osmosis, oil refining, chemical, food processing plants, and water treatment.